MICA had their Annual General Meeting Tuesday evening, June 3rd at the Lunenburg Yacht Club. In his annual report, Chair John Meisner recounted the many accomplishments of MICA during the past year, highlighted by the acquisition of Bella Island. Following the formal proceedings, guest Philip Finck, a Nova Scotia geologist with extensive experience in coastal preservation, gave an absorbing and fascinating presentation on the geological history, present state and likely future of the Mahone Bay Islands. 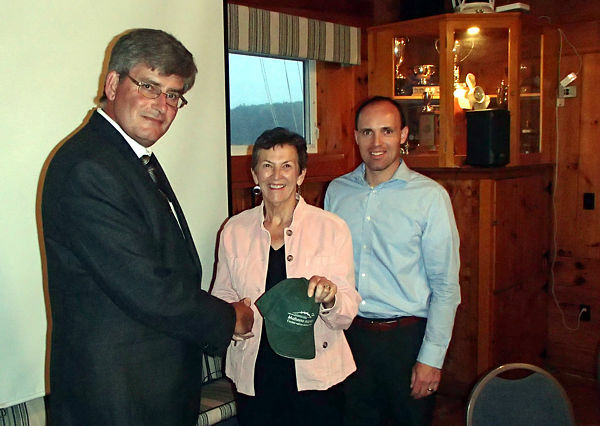 Sherry Swinamer and Georg Ernst present a MICA hat to our guest speaker Philip Finck.